You built and launched a learning experience that will take your participants on a journey through specially designed concepts, content, and key learnings. They will engage, interact, be inspired, and complete the course no doubt. Hmmm. Wait. Where are they? What went wrong? High engagement does not necessarily start with great content. 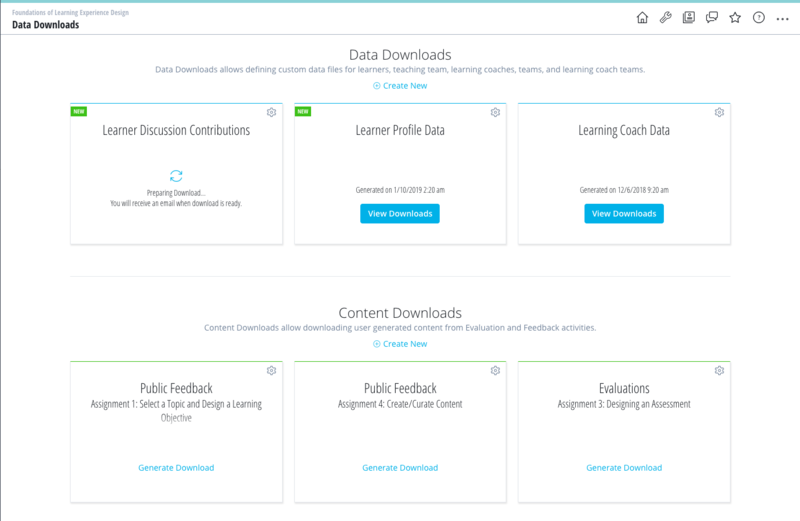 It also includes learner-centric design, a structured engagement plan, and actionable live-course data. By designing a learning experience with engagement in mind, you will ensure that your learners cross the finish line. Whether you have an extensive toolbelt and are now looking to refine your skills, or you are new to the world of facilitation, these best practices can help keep your course on track. The earlier you can identify your audience’s motivational drivers, learning styles, and strengths, the better. You can start to do so by diving into registration analytics to get a feel for your incoming learners and by trying to think critically about why they are enrolled in your course. For instance, was their registration a choice, or a requirement? And what, beyond the promise of a certificate, will motivate them to keep going? In order to reach a breadth of participants, tailor your engagement strategy to suit a variety of learning styles; some prefer to be steered, some prefer self-direction, and some prefer social accountability to guide their learning. One way to account for multiple learning-styles is to provide your learners with a variety of motivational tools. For instance, if they were self-motivated to register, you might incorporate more “carrots” than “sticks” in order to keep them engaged. On the NovoEd platform, these might entail points, a leaderboard, or discussion contributions. Conversely, if your learners are required to take your course, you may want to design for “sticks” rather than “carrots.” This might include team assignments, mentorship, and strict deadlines. A successful course builds an engagement plan around its expected audience and accounts for differentiated learning-styles. By recognizing that each learner has their own reason for registering and may not respond to the same motivational tools as their peers, you will have designed an engaging course suited to each member of your audience. Backward plan by determining what a successful course means to you and your organization. Do you expect to track specific metrics? Do you expect to certify a certain number of participants? Or, do you expect to reach as wide an audience as possible through your content? Next, lay out your facilitation strategy by scheduling nudges to keep participants on track. 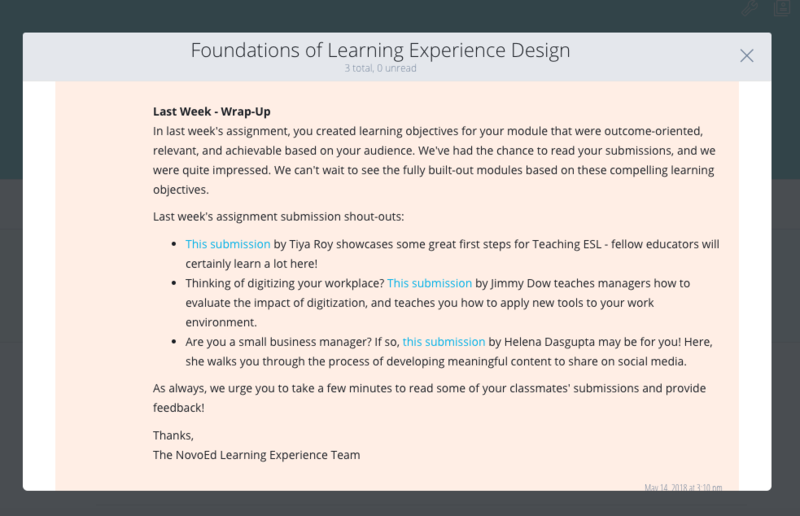 Some examples of what we recommend at NovoEd include intervention emails, announcements, and knowledge checks at the end of each module/section. To go the extra mile, implement peer-to-peer accountability and engage those who are socially motivated by including individual shout-outs in emails. Having implemented your strategy in advance, you will be able to direct your focus on reacting to learner activity data and ensuring a personal learning experience for your course participants. Data need not be impersonal. Once your course is in full swing, regularly review its activity metrics and use these to inform your action items. One way to do so in the NovoEd platform is to generate customized reports using the Data Downloads and Survey features. In order to drive engagement during a live course, take action on the unexpected metrics by leveraging the high metrics. For instance, you may discover that assignment completion is low, but team workspace activity is high. This suggests that your cohort is more socially than autonomously motivated, and is more likely to succeed by submitting team assignments. Modify your upcoming assignments to allow your learners to work in teams. Mid-course surveys are another valuable asset for driving engagement. Make sure that the questions you ask mid-course are ones that you can also address mid-course. If, for example, a learner expresses discontent with their team, be prepared to re-assign them. By taking action on your data, you are empowering your learners to succeed by supporting their needs and giving them a voice. In Sum: Be Prepared, Be Flexible, and Be Personal! Engaging learning starts with design and ends in facilitation: Start strong by engaging with your audience in mind; plan ahead by identifying your goals and developing an engagement plan; take action by leveraging learner data to create a personalized learning experience. To learn more about the features references in this post and how NovoEd can enable your organization to create a customized and highly engaging learning experience, contact us to speak with a learning specialist or view a recording of our product tour.